Now that it's finally cooling off in the desert southwest, I've been thinking about getting something to attach to the bike so Madame and I can go riding together. And like it was fate, last week I was tipped to a new bike/child carrier combo called the Trio Bike. The Trio Bike is a bike/bike with child carrier/stroller combination. 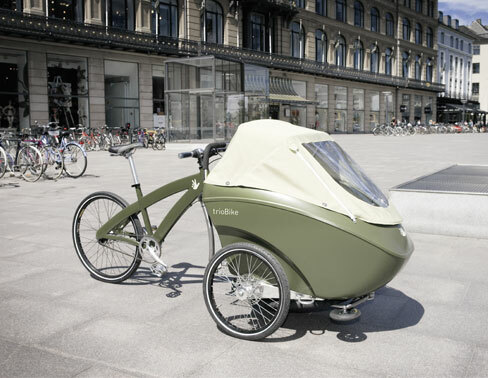 The child carrier (which holds two kids apparently) attaches to the front of the bike, but it can also be removed and pushed around like a stroller. I'm guessing it would be best for people who live in a city without a car. Actually, only a city that was used to people on bikes - which I suppose would make it best for people who live in small, ancient European cities. Or China. I like the idea, but the stroller adaptation seems way too big to use practically (from this picture it looks like you could barely fit it in a grocery store aisle). This definitely isn't the bicycle child carrier for me, but I'm always happy to pass along a good idea to my faithful readers from Beijing. Also on MDD - The WeeRide Bicycle Seat.